Experience freefalling from up to 12,000 feet at 130 miles per hour! You are a beginner as far as skydiving is concerned, but want to see the world from a different perspective and are looking for an adrenaline rush? 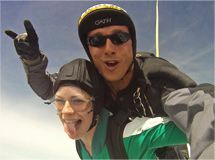 Then a tandem jump is the best way for you to get started! 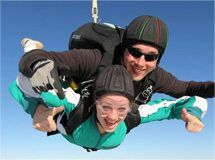 One of our experienced tandem instructors will give you a detailed briefing on the procedures of parachute jumping. After that, you will join them in going up to the dizzying height of almost four kilometres. Getting there, you will have ample time to enjoy the breath-taking view. Once your tandem instructor has securely harnessed you to his or her suit, the door of the aircraft will open, and it’s “Ready for skydiving“. 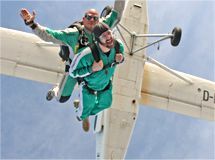 You will jump from the plane and experience the unforgettable feeling of freefalling first-hand, until the chute opens at a height of 4,500 feet. On the way down, which will take between five and seven minutes, your tandem instructor will show you how to steer the parachute and land safely. If you are between 4‘6‘‘ and 6‘6‘‘ (1.40 m – 2 m) tall and weigh between 6 and 14 stone (40 kg – 90 kg), there is nothing keeping you from the jump of a lifetime! To book a jump, just get in touch with us by phone, or use our Contact form to email us. You should set aside half a day for the experience, and refrain from drinking alcohol for at least eight hours leading up to the jump. We recommend comfortable clothing and trainers, and ask that you remove all jewellery before the jump.